The Tsar Bomba, or “Big Ivan” as the Soviets nicknamed it, is the single most powerful man-made explosive device in human history. But why was such a device even made? Well, for similar reasons as to why the U.S. once thought it would be fun to nuke the moon– basically, the bomb was little more than Russia demonstrating its military might and ingenuity; it was simply too massive to be easily deployed in regular warfare, particularly nearly impossible for the Soviets to effectively deploy against the U.S. The bomb itself was so powerful that the survival rate for the pilot and crew aboard the plane that dropped it was estimated at 50%, and they were 10 km (about six miles) in the sky and 45 km (28 miles) away when the parachuted bomb detonated at an elevation of about 4 km (2.5 miles). And this is after they reduced the total yield of the bomb by half. So surely such a device was tens of months, if not years in the making, no? Of course it wasn’t, we’re talking about a country where popular alcoholic beverages are practically weapons grade. All in all, the bomb was built (and designed) by a small team of scientists and physicists in, and this is where sources are hazy, between 14 and 16 weeks… Seriously. The bomb was the brain child of Nikita Khrushchev, who was keen to show America that Russia had a huge set of nuclear balls. Khrushchev arranged a meeting with his lead weapon designer, Andrei Sakharov, and basically told him that he wanted him to do something to “show the imperialists what we [Russia] could do”. It’s not clear when the idea of making it a 100 megaton bomb came about or who made the suggestion; what we do know is simply that Khrushchev tasked Sakharov with building a device of “record breaking power“. Keen to do his boss proud, Sakharov gathered a team of crack experts (three of whom were called Yuri, for maximum Russian-ness) and between the five of them- yes there were only five of them- in less time than it normally takes to knit a blanket, they created a bomb capable of turning a city into a dark smudge. While the bomb was being designed and built, Khrushchev positively reveled in the fuss the bomb was creating. As the device was being built for little more than a show of force, the usual secrecy measures were ignored and Khrushchev loved that. In fact, Khrushchev took great satisfaction in casually explaining the sheer power of the device and how they’d have to make it less powerful. Sakharov was decidedly more reserved when quizzed, only answering that the bomb was a symbolic “dagger of Damacles” hanging over the heads of anyone who might oppose Russia. In regards to Khrushchev’s comments, the device did indeed need to be severely limited in power partially because of concerns over nuclear fallout, but also because, as noted above, the pilot and crew dropping the bomb only had a 50% survival rate; if the device had been detonated at its maximum potential, this would have almost certainly been 0%. The device did indeed have the potential to be detonated with a yield of 100 megatons, though, but after some modifications- particularly using a lead tamper instead of one made of depleted uranium in at least one of the three stages, and possibly two, this was halved to a “mere” 50 megatons, which for your reference is over 3000 times more powerful than the bomb dropped on Hiroshima. 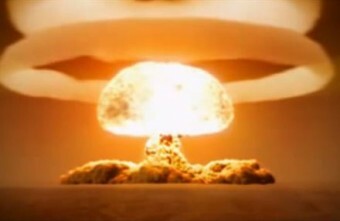 The modifications also helped the device break yet another record, along with being the most powerful nuclear bomb ever detonated, it’s also the cleanest relative to the yield, as the modifications along with halving the yield also removed 97% of the device’s potential fallout. On the 30th of October 1961, preparations had been finalized and Russia was ready to show the world just what a 50 megaton explosion looked like. However, even the final preparations were a tricky task as finding a plane capable of even holding the bomb was something that required a team of engineers and a slew of modifications to the chosen plane. In the end, the bomb was carried by a heavily modified Tupolev Tu-95. By heavily modified, we mean half of its bottom section was ripped out to make room for the bomb, with half of the device awkwardly protruding from the plane. The bomb itself weighed in at over 25 tons and measuring over 8 metres in length. After the plane was painted with reflective paint (to partially protect it from the heat from the explosion), they handed the keys to a guy with balls that were only rivaled in size by the bomb he was tasked with dropping, Major Andrei E. Durnovtsev. When detonated, the bomb released a shock-wave so powerful it was noted to have circled the Earth 3 times and was sufficiently powerful enough to shatter the windows of a building 900 KM away… in Finland. To say that the explosion absolutely decimated the area immediately surrounding it is an understatement. The “total destruction” blast radius of the bomb was a full 35 km (22 miles) and every building in a small abandoned village 55 km (34 miles away) was also leveled. The team surveying the area afterwards noted that the land surrounding the site was akin to a perfectly smooth “skating rink“… and that’s the image we’d like to leave you with, Russian scientists gleefully skating around in full scientists garb, presumably tossing a Geiger counter back and forth in a friendly game of keep-away. It’s a damn sight less scary than the image of a bomb made by a handful of scientists in just a few months that was so powerful it could reduce any city on Earth to a sheet of glass in under a minute. The Tsar Bomba was the last weapons project Sakharov worked on; horrified by the power of the device he’d helped create, he became a staunch opponent of nuclear weapons shortly after the test was completed. When the shock wave hit the plane that had dropped the bomb, it caused it to fall about one kilometer in altitude. The device went by many names including, Big Ivan, Kuz’kina Mat’ and in official documents RDS-220. The designation, Tsar Bomba, is a reference to the numerous other oversized things built by Russia with the same pre-fix, the Tsar bell and cannon respectively. The device was calculated to be 1,400 times more powerful than the combined explosive power of both bombs dropped on Japan during WW2. However, it was calculated as only containing 25% of the power of the explosion that rocked Krakatoa, which exploded with an estimated force of 200 megatons. My understanding is one of the reasons the soviets built and detonated this bomb was to prove to the world that although their missles were not very accurate, this would not stop them as a nuclear force. That’s not actually the Tsar Bomba on the posted video, that’s a cgi simulation. If you get on Google Earth and zoom down to ground zero, you can see a smooth, grey area 40kms x 30kms on the peninsular. Its a sheet of glass 4ft thick and the bomb was detonated at 13,000 ft. It’s estimated that the temperature inside the fireball that went almost into space was in excess of 10,000 degrees. That temperature is about the same as the surface of the sun. In fact the bomb replicated the fission on the sun, but on earth. Imagine what the 100mT version would have been like? People I spoke to said that the earths crust is only 20 miles deep and the scientists at the time feared that the explosion would have cracked the crust and caused a volcanic event rivalling the one that killed 90% of life on earth about 60,000 years ago. Fireball temperatures are in the tens of millions of degrees. The top of the cloud was 211000 ft / 40 miles. Cracking the crust? Doubtful. And to add to the credibility, you’ve used a clip from an undergrads CGI demo reel. Facepalm.